Huge Savings Item! 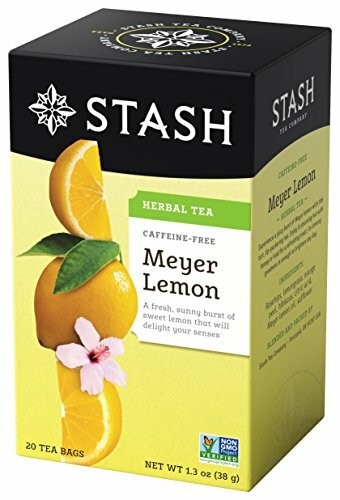 Save 15% on the Stash Tea Meyer Lemon Herbal Tea 20 Count Tea Bags in Foil (Pack of 6) (Packaging May Vary) Individual Herbal Tea Bags for Use in Teapots Mugs or Cups, Brew Hot Tea or Iced Tea by Stash Tea at Jakis Cafe. MPN: 08244. Hurry! Limited time offer. Offer valid only while supplies last. LEMON WITHOUT THE PUCKER: An artfully crafted herbal blend of rosehips, lemongrass, orange peel, hibiscus, Meyer lemon oil and safflower, this tea is burst of lemon flavor without the lip-puckering tartness. Enjoy hot or iced, sweetened or unadorned. TEA OF INCOMPARABLE QUALITY: Compare our quality teas to competitors--Numi, Choice, Yogi, Bigelow, Harney & Sons, Celestial Seasonings, Davidsons, The Republic of Tea, Teavana, Kusmi, Traditional Medicinals, Tazo, Rishi, Twinings, Mighty Leaf, Good Earth. If you have any questions about this product by Stash Tea, contact us by completing and submitting the form below. If you are looking for a specif part number, please include it with your message.